The military uses intermodal shipping containers (aka ISO containers or Conex boxes) for transporting equipment and supplies to bases all over the world. Robust and big enough for most applications, these versatile metal boxes are suited for that task. They are easy to maneuver and stack in position. But, one thing they are not designed for is chemical storage. Military bases use and store a wide variety of chemicals. They use some of these supplies daily for routine operations and maintenance activities. Other supplies remain in storage until needed. Base preparedness depends on keeping equipment and supplies in good condition and accessible. So, is it okay for the military to use ISO containers for chemical storage? No – and here are five reasons why. All hazardous material storage buildings must provide spill containment. Intermodal containers don’t have an internal sump to capture product spills. Any material that spills inside the container can leak out into the surrounding environment. Even if you place chemicals on spill pallets inside the container, it still doesn’t meet EPA and OSHA regulations for secondary containment. If the spill is a flammable chemical, the risk is even greater. A fire could start outside the container and ignite the spill all the way back to the source, causing an explosion and possible loss of life and inventory. Chemical storage buildings from U.S. Chemical Storage have liquid-tight secondary containment sumps built into the floor. Sumps must contain at least 10 percent of all total liquid volume stored, or 100 percent of the largest container of liquid in storage. Per NFPA requirements, all hazardous material storage buildings must also provide low-level air inlets. ISO boxes do not. Vent access prevents the buildup vapors inside the building that are hazards for personnel and fire safety. During a spill situation, the vapors inside the area can create an explosive environment. 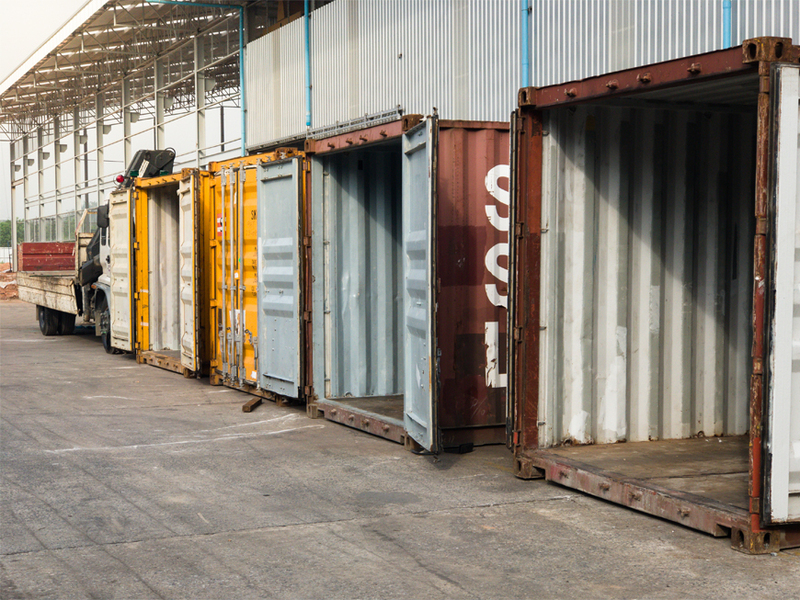 This means that an intermodal container could be one spark away from a serious incident. U.S. Chemical Storage offers both passive and mechanical ventilation systems. Operating an explosion-proof mechanical ventilation system prior to entering a chemical storage building will eliminate dangerous fumes and vapors that can harm personnel and be a fire hazard. Chemical storage buildings storing flammables or combustibles located less than 30 feet (10 meters) from occupied buildings or property lines must be 2-hour fire-rated. Site locations closer than 10 feet require a 4-hour fire-rating. Intermodal containers have no fire resistance element to their design. When exposed to an external fire, the internal temperature will quickly rise above the autoignition temperature of many flammable liquids increasing the risk to personnel and vital equipment. Protect your mission-critical chemical inventory with 4-hour SUPERLoc or 2-hour FIRELoc chemical storage buildings. Customize buildings with optional accessories to meet your critical operational needs. ISO containers are often placed directly on the ground and do not allow visual inspection on all sides of the building as required by EPA. Regular inspections are vital to identifying leaks and taking corrective action. A spill inside an ISO container could contaminate the earth and groundwater for months without anyone being aware of the problem. The military can avoid the potential high costs associated with environmental cleanup and downtime by installing a pre-fabricated, NFPA-compliant chemical storage building. The flat metal roof of intermodal containers creates the perfect environment for pooling of water and the onset of corrosion. Pinhole leaks turn into holes. Before long, water is a regular presence inside a hazardous chemical storage environment, increasing the corrosion process. In addition, it allows for water infiltration, which may be incompatible with some of the chemicals being stored. Metal containers of oil, fuel or other hazardous chemicals inside the ISO Conex box can also start to corrode, resulting in leaks. All U.S. Chemical Storage buildings include a sloped roof which facilitates water runoff and eliminates the accumulation of storm water experienced with military ISO containers. This prevents accelerated corrosion and extends the life of your building. U.S. Chemical Storage designs, manufactures and supplies chemical storage buildings for the military. Our experts apply the relevant codes and regulations to your application and design a solution that is code compliant and safe. Let us help you maintain your mission readiness at all times with chemical storage buildings. Contact us for a free quote today.